I am writing this while swinging at anchor in Port Hadlock, at the bottom of a quiet little bay (well, except in north winds) that extends south a few miles from the playful town of Port Townsend. On the hook, the pace is languid; an hour or two can be spent learning variations on the bowline, and it makes perfect sense to pick an arbitrary course and go circumnavigate something in the dinghy just to warm the muscles. 120 feet of chain connects the boat to the earth, but it feels like a mile. The days leading up to this have had a much different flavor, however, even though most of them took place in Port Ludlow amidst a swirl of new friends. 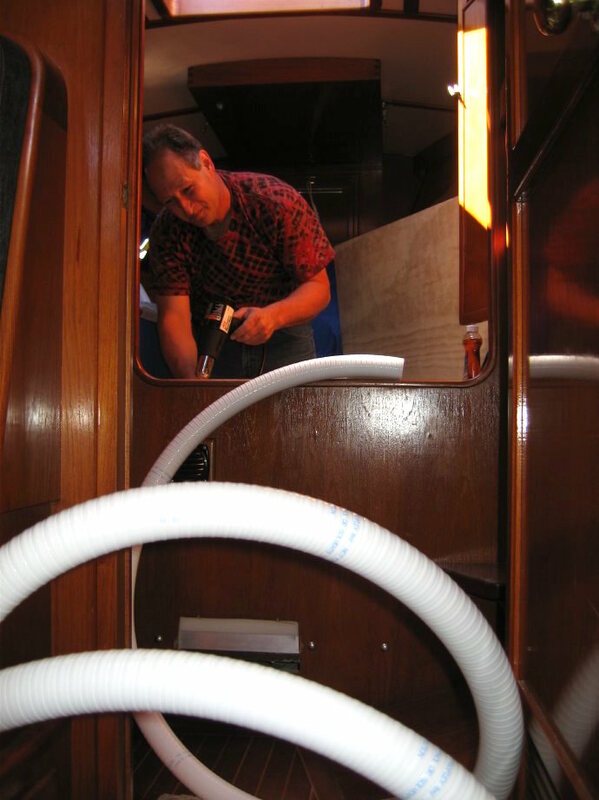 On center stage has been Bob the plumber, installing the new holding tank and helping simplify the insanely complex network of poo-handling equipment that came with the boat. As you may recall, the original system included two heads, four Y-valves, an inscrutable small steel holding tank, and a LectraSan. 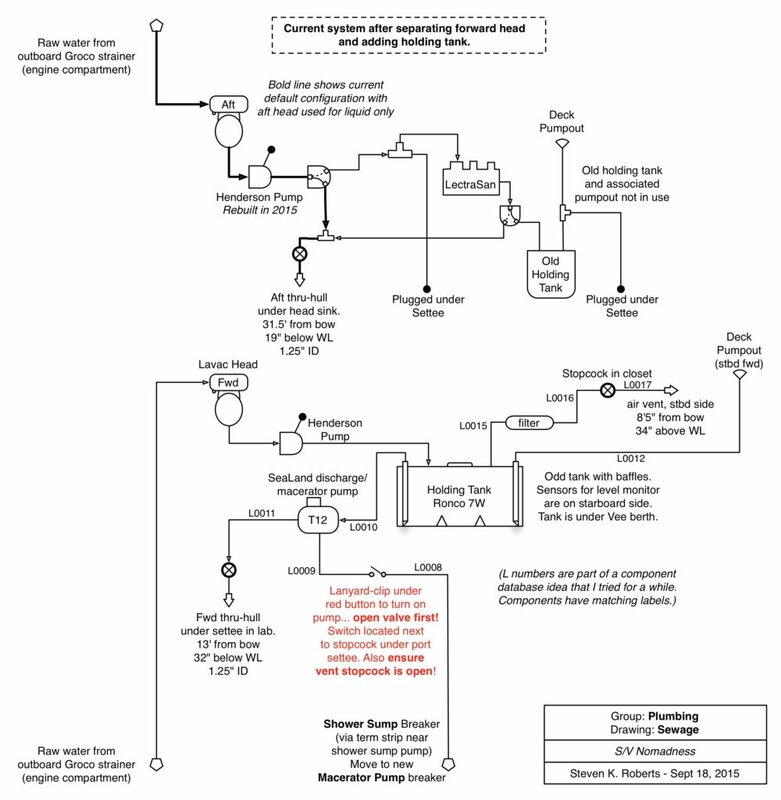 Sewage could travel from the aft head to the processing system and then into the holding tank, later to be pumped out via a repurposed Lavac pump in the forward head… and the combination of obscure modes, potential error conditions, long stagnant hoses, dubious legality, and a malfunctioning LectraSan had us vigorously rowing to shore far too many times. Now at least part of it is simple. The forward head (Lavac) pumps directly into a 35-gallon tank (no Y-valve). 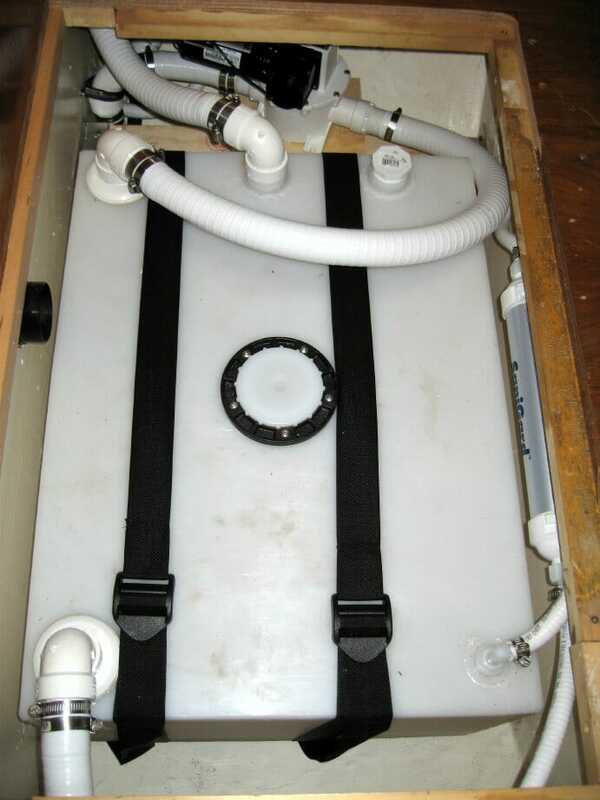 Pump-out is via a new deckplate or through an electric diaphragm pump directly overboard (when well offshore, of course), and there is a vent tube with carbon filter and stopcock for nasty conditions. That’s it. This doesn’t sound like something that should take three days and cost more than a fine laptop, but as Bob was fond of pointing out, nothing is ever easy on a boat. To wit: I had to rip out the framing under the V-berth and expand the access, just to create a space where all this could fit. As much as I wrinkle my nose at the thought of hauling this and its contents around, it certainly is liberating (and it works). Onward! Note added in July 2009: in retrospect, this was a disaster. Although he did accomplaish things that I found intimidating at the time (a through-deck fitting and retrofit of previous plumbing system), this guy did amazingly sloppy work, requiring at least 20 hours of chasing smells and fixing things. Specifically: a botched and leaking holding-tank Spinweld that had to be heat sealed, installation of the clean-out port in oversize hole by shooting in sheet-metal screws instead of the proper bolts (bulging the plastic and causing more leaks), and plugging an old sewage line with a screwed-in PVC cap that drips freely under pressure (instead of a proper tailpiece and hose clamps). All this for $80/hour, with an unfulfilled promise to come make anything good if problems developed. I would suggest avoiding First Mate Marine. 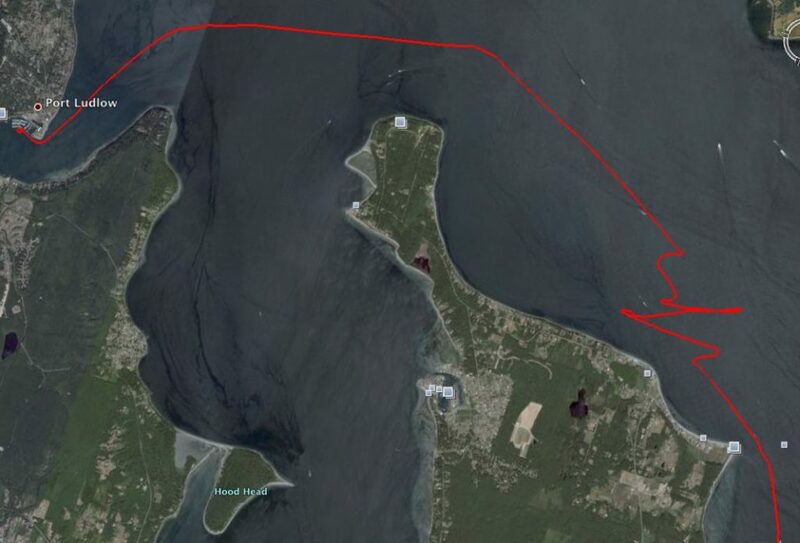 On that one westbound tack in the middle, it was getting glassy and I needed some sea room… so I tacked back out into the shipping lanes to make it around the shoals and rocks off Foulweather Bluff and Tala Point. Since I have no chart plotter yet and was piloting by the seat of my pants, it was a pointless maneuver in 3 knots of contrary current. You can actually see the “awww, screw it” moment a little while later. I powered up and motored on, making port at dusk. Sailing is like that, and it pays to remember that a sailor with no schedule always has fair winds. The engine wears on the nerves after a while, and purists cringe at the thought of a 77-horse turbo diesel in the belly of a lovely sloop, but sometimes… 1 gallon per hour is a good investment. Speaking of on-board systems that complicate the simple purity of sailing while keeping one out of trouble (or at least entertained), we are now enroute to Anacortes for a quote on the bow thruster, and will then spend some layover time to upgrade the power system with all Outback gear. This may turn into an extended project including the 480-watt solar array, but I am more than ready to get rid of the self-resetting Link 10 and the noisy Prosine 2.0 that it’s attached to… and while at it, I’ll start integrating some of the other gear that is gathering dust in the lab. 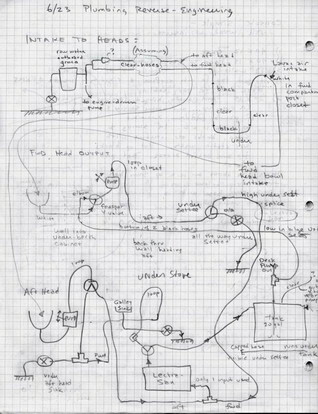 A flurry of communication contraptions are nudging my brain awaiting attention, as are such essentials as the watermaker, wood stove, dinghy tracker (don’t ask), video systems, music, the Datawake server, and Shacktopus. Logistically, this may involve the mobile lab, since there is simply no way to park a boat on Camano Island and I don’t want a repeat of the commute that characterized last winter in La Conner. that prioritizes projects by their actual urgency instead of their gizmological allure. and priorities, and swinging at anchor is now much more satisfying than chipping away at the endlessly expanding to-do list. Sky captured today well in both words and photos, and her blog is becoming an essential counterpoint to mine… synchronous in some ways, yet woven through with an almost alien perceptual thread that relaxes the focus. Her view of this is completely orthogonal to mine, yet together we get things done and savor the moments. 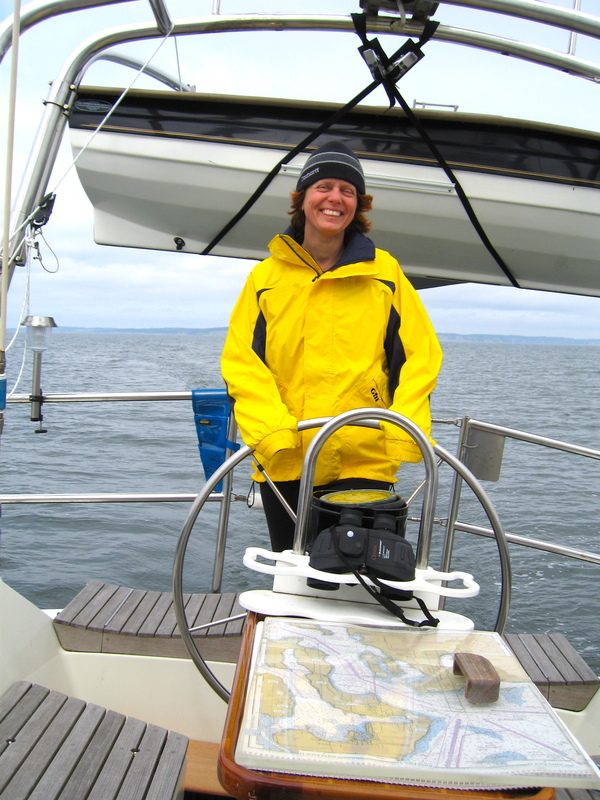 Which, of course, is what sailing is all about, once all the technology is in place to make it all work. That’s the yin and yang of life afloat. My favorite element of these posts is looking at the little navigation diagram. Perfect circles one time and “oh screw it” tacking the next. Are you all set on plumbing now? Hi! Yes, for now the plumbing is done, though the aft head will eventually be simplified. At the moment, it can go to the old tank, through the LectraSan, or overboard. Yah, the tracker is a hoot! Every second recorded, including the awkward maneuvers, oopsies, lapses of attention, and wrong marinas. Soon it will be real-time via APRS, though with much less resolution. Hi Steve, grinning about the tacking comments, I noticed the idea of tracking the dingy and wondered if you had thought of either of using our Sea-safe trackers, as they are small, have a very long battery life, and will work when out of VHF Ham range so ideal for finding one if lost off the boat or stolen. Ideal for man or lady overboard too. Good to see that the Lectra San seems safe for now !. Kind Regards, Michael.